Pohang, South Korea, 05 November 2008 — An AH-1W Super Cobra helicopter from Marine Medium Helicopter Squadron 262 (REIN), 31st Marine Expeditionary Unit (31st MEU) flies over South Korean marine corps amphibious assault vehicles from the 1st Marine Division as they conduct an amphibious landing rehearsal during Korean Incremental Training Program '09. 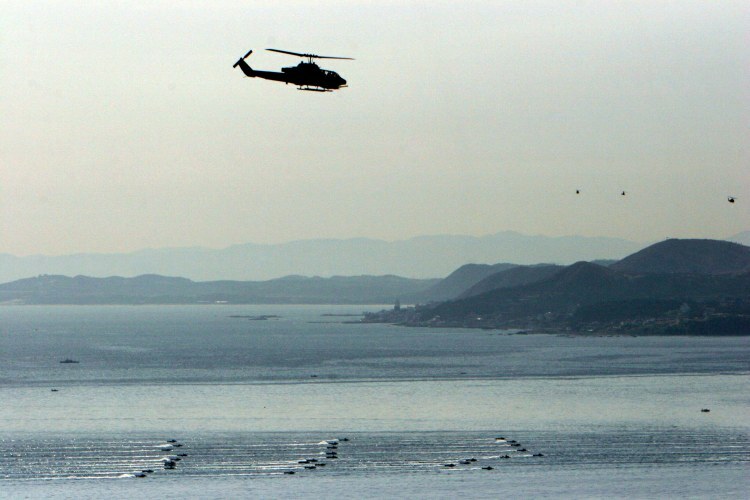 The amphibious landing was conducted to provide ROK military with the sustained capability to respond to future contingencies from ship to shore. KITP is an annual bilateral exercise to maintain readiness and sustain the long-term security assistance relationship between ROK and U.S. military forces.